Skills and Abilities: Natural born leader and strategist. Powers: Due to the events of the Big Bang Rolando possesses the power of talismanic telekinesis; this means he produced energy which could be dispersed through any projectile weapon in his possession. Thus any weapon he held had an infinite supply of ammunition. In addition to this he had uncanny aim and never missed a target even if he did not aim. Rolando and Carlos Quinones jr. were friends ever since they met as kids.They looked out for each other and while Carlos never explicitly told Rolando he was gay, Rolando knew but realized it was too painful a topic to talk about for his best friend [Revealed in Interview with Ivan Velez Jr.]. 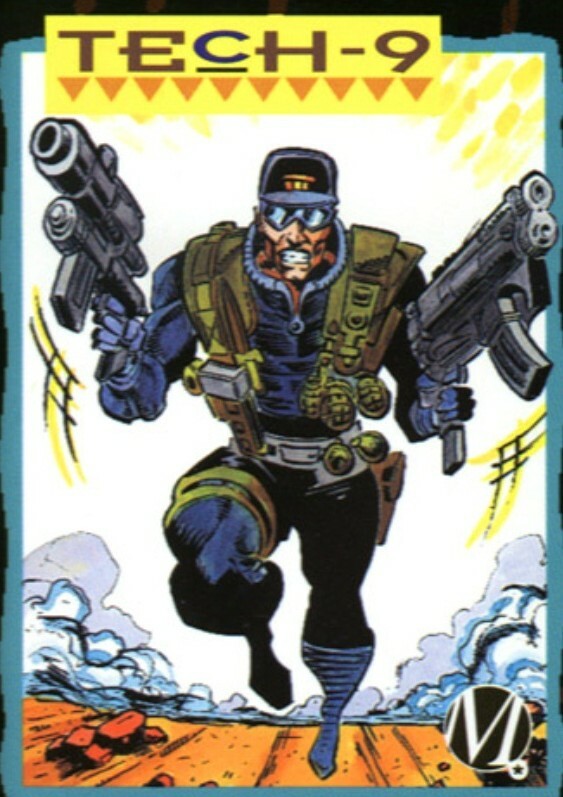 Tech-9 was a loyal founding member of the Force Syndicate, one of the more benevolent gangs in Dakota. They didn’t run ‘guns or rock’, they didn’t do “evil %$#@” to their own people either and as a result were the least respected gang in Dakota. When all the gangs got together to battle it out for respect and turf on Paris Island the Force Syndicate was there and had a real shot at finally getting for respect. That was until the cops arrived and stared using the experimental tear gas, filled with “Quantum Juice” [Blood Syndicate #2]. Hundreds of gang members started dyeing from the gas but somehow Rolando got back on his feet and grabbed Dogg and fled from the scene. As he fled he saw the effects of the gas on the other gang members, he saw Aquamaria fade into water and even the cops started to die. He passed out and woke up at Fade’s house [Blood Syndicate #2]. He discovered that on the night of the Big Bang, he was blessed with the ultimate compliment to his natural marksmanship ability-no weapon he holds ever runs out of ammunition. 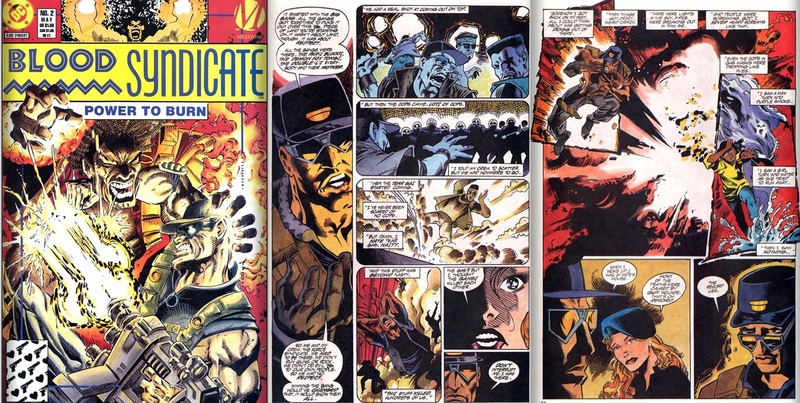 His obsession with military strategy and discipline lead him alongside Fade and Flashback to recruit Holocaust, Maquerade, Wise Son, Third Rail and Brickhouse to form the Blood Syndicate [Blood Syndicate #9]. Rolando tried to steer the team in the same benevolent way he had done with Force Syndicate by having them take out drug runners and clean up the neighborhood [Blood Syndicate #1]. He was met by spirited resistance from Holocaust who was once a member of the vicious Paris Bloods. He led the team and eventually had to defend his leadership mantle from the more physically powerful Holocaust/Pyre [Blood Syndicate #2]. He continued to lead as the team saved Brickhouse from being captured and welcomed new member Boogie man [Blood Syndicate #3]. They also discovered a mysterious organization abducting and experimenting on “Bang Babies”. That night hey celebrated their victory. His powers were unstable however and his body liquefied soon after killing him instantly. He died in the arms of his best friend Fade [Blood Syndicate #4-5]. After his death, his grave was desecrated by the demon fox who used magic to make Maquerade his duplicate and even mimic his powers [Blood Syndicate #35].